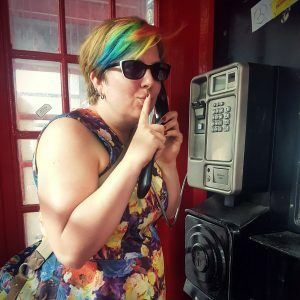 I was invited by Love Popups London to come along to A Door In A Wall‘s Dead Man’s Hand immersive murder mystery game. After having played their Horses For Corpses game a while ago, I was excited to try this new one out! Seeing as none of the three people on our team plays poker, we were wondering if we would be at a disadvantage. However, the most important rules were laid out in a rule book and everything else was unrelated to the game, so it wasn’t much of an issue. 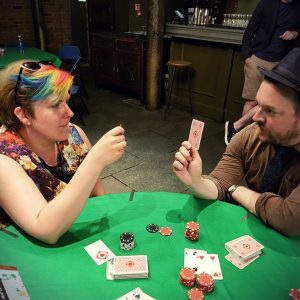 The premise of Dead Man’s Hand is quite simple, an underground high-stakes poker club is in trouble, one of their members was murdered after a game the previous night. As members of this club, we now have two hours to solve the murder or the police inspector will shut us down. Armed with a list of locations where we’ll find witnesses and clues, we head out into the bright sunny day to put the story together. We randomly selected one of the six locations and went to find the first clue. Unfortunately we happened to select the only one of the six clue trails that involved some being sent back and forth, which I really don’t like in this kind of game as it seems like artificially prolonging a trail just to make it take longer, so I thought we weren’t up to a great start. However, the game recovered quickly with much more interesting and involved clue trails that were a lot of fun to work on! We only got slightly stuck once, but with the help of the lovely bar staff at a local pub, we swiftly recovered and went on to solve the puzzle. Each clue trail resulted in more information about the victim and suspects, helping us to put the story together and gain a bit of an idea of what might have happened that fateful night. We had a lot of fun with this game and managed to solve all six trails and still return to the club at the designated time. Back at the club we were given an answer sheet to fill out, detailling the who, why, and how of the previous night’s murder. Some of the questions were a bit tricky as certain bits of information were only available through recorded phone calls and there were quite a few red herrings. We still felt like we got most of the information correct when we handed in our answer sheet. The final presentation of the true facts of the murder was done very well and gave us the whole story of what happened. The team with the funniest team name as well as the team with the most correct answers were awarded prizes, we didn’t quite get everything right but we were very close to the truth! 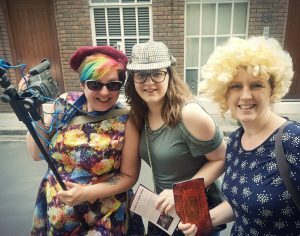 All in all, this was a super fun four hours spent in a very immersive murder mystery! I’ll definitely be returning for more A Door In A Wall games in the future. I’m rating Dead Man’s Hand five out of six rainbow sloths, only deducting one sloth for the run-around clue trail as well as the phone-only clues that are difficult to share with the group. There also wasn’t a page for notes in the rule booklet, as there used to be with previous games. This should definitely be brought back as we struggled writing everything down. Other than that it was a brilliant game and I really enjoyed it!